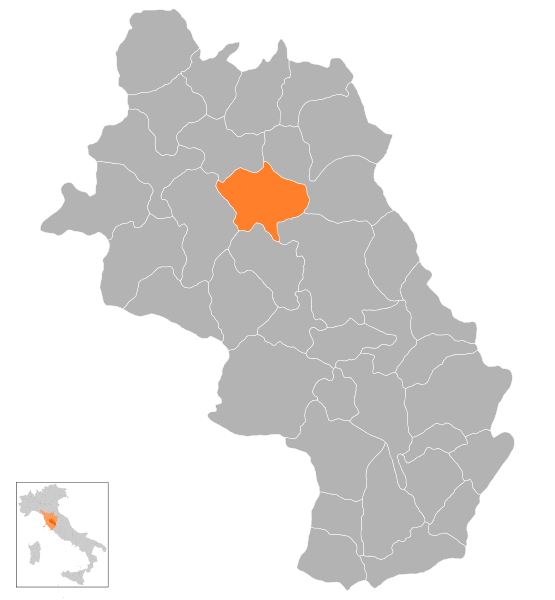 Caterina di Giacomo di Benincasa was born on 25 March 1347 in Siena Italy, to Giacomo di Benincasa, a cloth dyer who ran his enterprise with the help of his sons, and her mother, Lapa Piagenti, possibly the daughter of a local poet. She and her sister were the twenty-third and twenty-fourth of twenty-five siblings and the only one of the twin daughter able to breast feed from her mother, which may have given the two a special bond that manifested later in her mystical visions. Her father also showed considerable interest in her intellectual endeavors and supported her learning to read, although her level of literacy remains unclear, as the term illiterate, during the Middle Ages, had varied interpretations. Most likely, she learned to read at an elementary level from studying the scripture during her adolescent and young-adult periods of religious solitude. Catherine lived until she was thirty-three and had no formal education, yet she is canonized as a saint of the Roman Catholic Church, a doctor of the Roman Catholic Church, and wrote over three hundred and eighty letters—many of which had huge social and political impact. The most notable letters Catherine wrote to Pope Gregory XI to move the papacy from Avignon back to Rome. Also, when Catherine had visions later in life and wrote her letters, she often had a trusted spiritual advisor to write down her narrations. According to medieval scholar Jennifer Summit, women’s visionary writings were often recorded by “’textual mediaries,’ the spiritual director who wrote down a woman’s vision, [and was] a constant presence,” in the lives of spiritual women such as Catherine of Siena (Ashley 515). Catherine’s self-described union with Christ was a private one, “centered in a life of quiet union with God” (Noffke xiii). Fascinated with religion from an early age, Catherine is documented to have had her first religious/mystical experience, when she experienced a vision at the age of six. She reported to her family and spiritual advisor that the vision was of Christ with the Apostles Peter, Paul, and John the Baptist. Her relationship with her family was a unique one, in which she envisioned her father as a Christ figure in the “inner cell” of her mind. She also chose to envision her mother as the Virgin Mary and her brothers as the apostles. In some of her early writings, she describes how she “enters into her cell” or mental fortress to pray. In an attempt to avoid an arranged marriage around the age of twelve, Catherine protested by cutting off her hair and taking a secret vow of virginity. Some scholars emphasize the fact that Catherine may have begun her refusal of food and cutting of her hair to deny her sexual female identity. She also welcomed the punishment given by her family as a means of further committing herself to the service of God. Her religious practices were ascetic, meaning she strictly self-enforced many of her rules and regimens for her faith that were not necessarily required by any particular order or sect of her faith. Catherine’s personal commitments to her relationship with God and as a self-proclaimed Bride of Christ, when she was older, make her a fascinating medieval religious figure. Catherine went so far in her commitment as a Bride of Christ that she wore an iron chain around her waist as a symbol of her chastity and slept on her floor or on hard boards to deny herself earthly pleasures. Her father finally relented on his plan of marrying his daughter off after seeing how gravely committed she was to her faith. Perhaps, he sensed her time on earth would be better spent using her gifts for worship than forcing a passionless marriage. In this regard, Catherine was a lucky young lady—many other female medieval spiritual leaders and mystics were forced into marriages or betrothals they then had to escape from. Christina of Markyate is a mystic and spiritual figure that comes to mind when thinking about the domestic struggles spiritual women had to endure. Once her father allowed Catherine to pursue her faith in entirety, she joined the Sisters of Penance of St. Dominic. This order was one generally reserved for older women and widows, so it was unusual for such a young girl to attend this establishment. However, this difference in age allowed her to meet women who would guide her on her spiritual path. For the first three years though, Catherine stayed in her room or in chapel knelt in prayer. It was during these times of extreme seclusion that she began to have clear and powerful visions of Christ. True to Catherine’s private, and highly intellectual nature, she formed her own personal theology of mystic vision. She had stigmata (the marks of Chris’s crucifixion) that only she could see and often had in depth conversations with Christ. Repeatedly, Catherine felt that Christ was compelling her to end her period of solitude and go forth into the world to serve humanity. 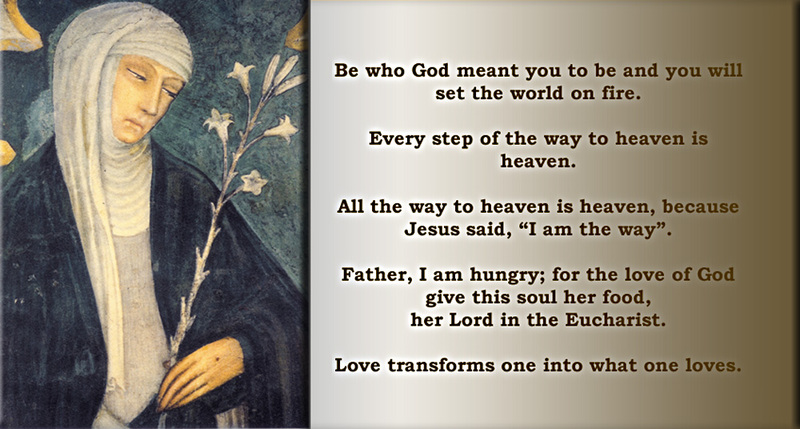 This call of duty lead Catherine to align herself with Franciscan and Cistercian orders of faith, as well as her own Dominican order, that encouraged helping the poor and not partaking in earthly delights. Catherine even went so far as to “donate” her family’s possessions to black plague victims—this may or may not have been done with her family’s permission! Catherine maintained her mystic relationship with Christ, and even out in the “real world” helping people would often go into trance and deep prayer and meditation. Siena is a small town near Florence, Italy, and eventually word got round of Catherine’s saint-like good deeds, extreme fasting, and mystic visions. Word also got round of Catherine because part of her vocation (calling by Christ) was to write letters to those she felt were spiritually and intellectually ailing. This included prostitutes and politicians. In fact, given the rights and social status of women during the Middle Ages, it is quite impressive that Catherine’s often direct, and sometimes downright pushy, letters of spiritual and moral encouragement did not get her accused of heresy or thrown in jail. She had such a refined sense of humanity and interpersonal interaction that she was able to deliver strong spiritual messages, without sounding insulting her audience. This ability stemmed from, not just her intellect but also, her very public dedication to her relationship with Christ. Her letters are what made her a famous medieval figure, but the life she lead is what made, and still makes, her so fascinating. Below you will learn more about her famous letters, the most famous of which are the ones that she writes to Pope Gregory XI urging him to move the Papacy (the political office of the Pope) back to Rome from Avignon, France. To get an idea of how brave this was, imagine handwriting or dictating a letter telling the President of the United Sates that not only are several of his policies flawed, but that he should also relocate the White House. Oh, and by the way, the President has the power to kick you out of the church, kill you, kill your family, or throw you in jail for being a heretic (religious traitor). However, Catherine’s faith was so strong and her conviction that Christ was speaking directly through her so honest and heartfelt that the people, even the Pope, were compelled to take her counsel! This was a good thing, because the Pope was losing power; religious battles and political disputes were erupting all over the Papal States (regions directly ruled by the Pope and the Roman Catholic Church). All of Catherine’s efforts paid off, and in 1377 Gregory XI moved the Papacy back to Rome. Unfortunately, Catherine’s life of extreme fasting and the stresses of her political endeavors got the best of Catherine’s frail body. In 1380, Catherine passed away at the age of thirty-three. She was canonized a few months after, and the religious relic of her head (Ack!) is on public display at the Basilica San Domenica in Siena, Italy. She was canonized in 1461, made a doctor of the Church, and is one of a small group of saints known as Eucharistic saints that dedicated themselves to the consumption and spiritual nourishment of the Eucharist. Catherine’s preserved head. Read more about it here. 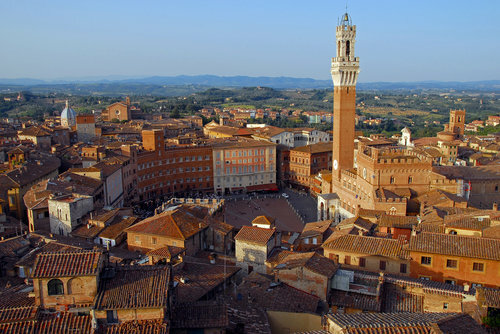 ~ Siena is located in a region of Italy called Tuscany in northern Italy. ~ The Piazza del Campo is the main square and center of the town. The main square of Siena. ~ Twice a year the Palio de Siena or il Palio is a famous medieval horse race in the main square of Piazza del Campo. 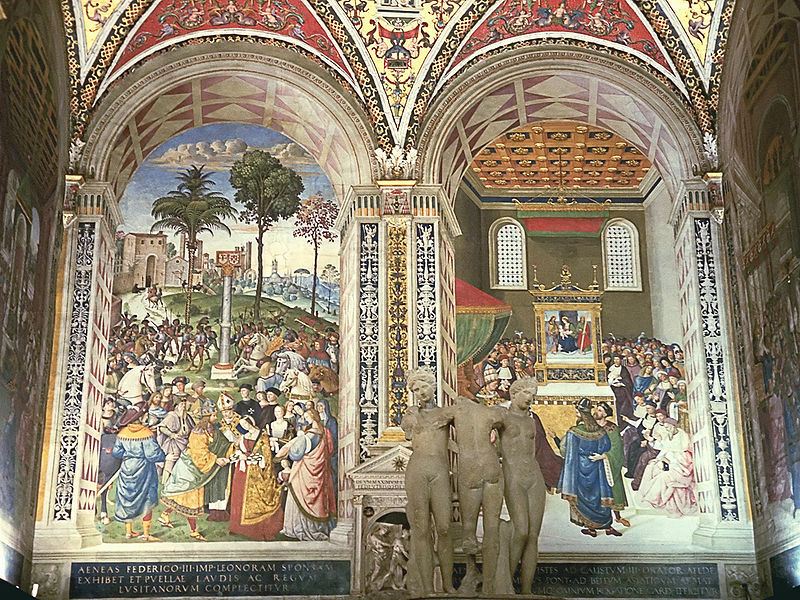 ~ The Siena Cathedral or Duomo is home to some classic medieval art. Left : Enea Silvio, Bishop of Siena, presents emperor Frederick III with his future wife. In front : The three graces, Roman copy from a Greek original. 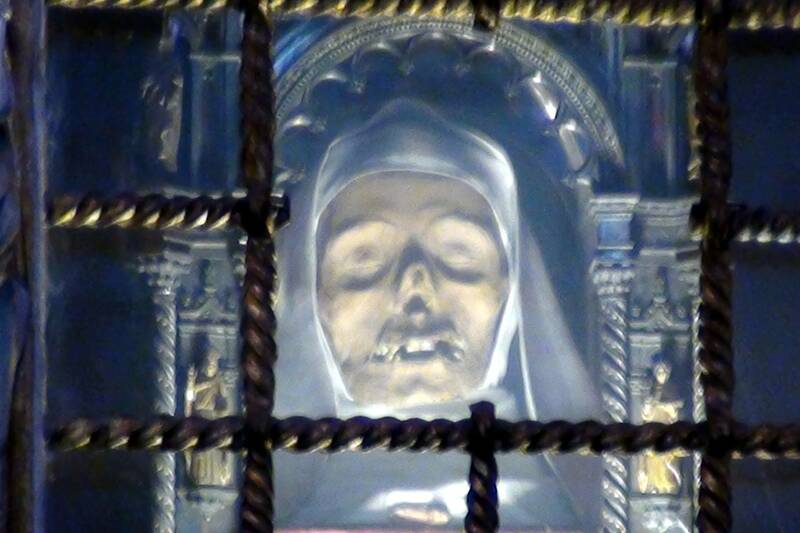 ~ The Basilica San Domenico is home to Catherine of Siena’s relic—her head! 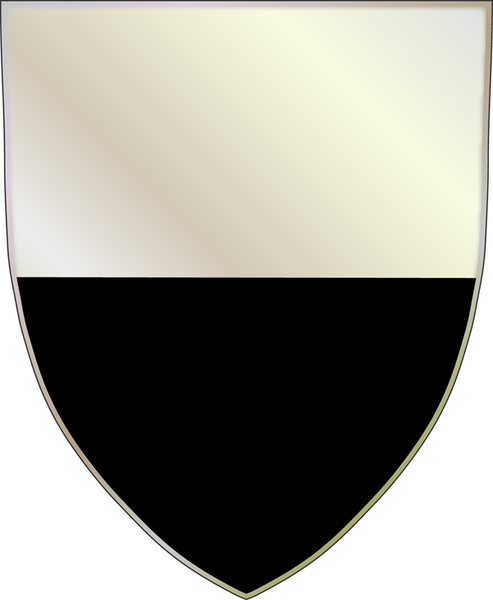 Coat of Arms of Siena. 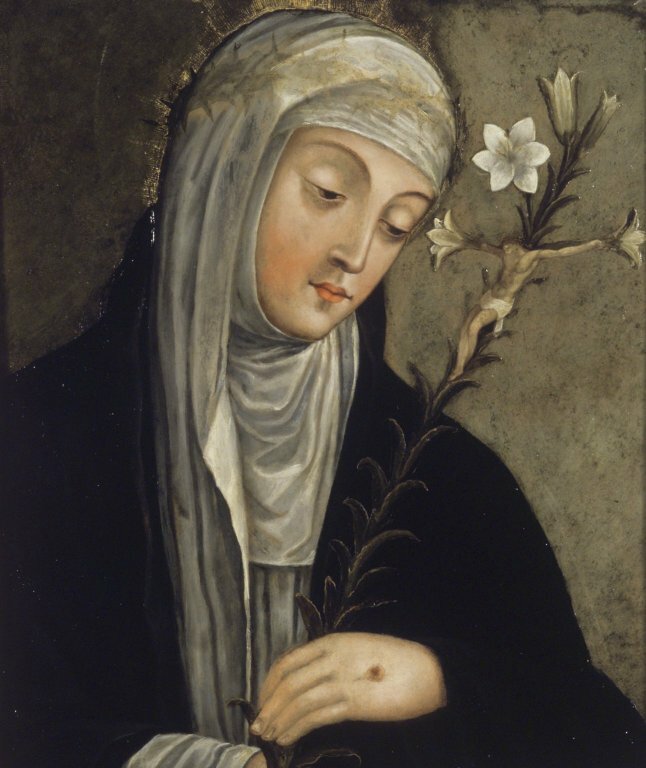 The letters of Catherine Benincasa, commonly known as St. Catherine of Siena, have become an Italian classic; yet perhaps the first thing in them to strike a reader is their unliterary character. He only will value them who cares to overhear the impetuous outpourings of the heart and mind of an unlettered daughter of the people, who was also, as it happened, a genius and a saint. Dante, Petrarch, Boccaccio, the other great writers of the Trecento, are all in one way or another intent on choice expression; Catherine is intent solely on driving home what she has to say. Her letters were talked rather than written. She learned to write only three years before her death, and even after this time was in the habit of dictating her correspondence, sometimes two or three letters at a time, to the noble youths who served her as secretaries . . . Imagination is inclined to see the canonized saints as a row of solemn figures, standing in dull monotony of worshipful gesture, like Virgins and Confessors in an early mosaic. Yet, as a matter of fact, people who have been canonized were to their contemporaries the most striking personalities among men and women striving for righteousness . . . Catherine Benincasa was probably the most remarkable woman of the fourteenth century, and her letters are the precious personal record of her inner as of her outer life. With all their transparent simplicity and mediaeval quaintness, with all the occasional plebeian crudity of their phrasing, they reveal a nature at once so many- sided and so exalted that the sensitive reader can but echo the judgment of her countrymen, who see in the dyer’s daughter of Siena one of the most significant authors of a great age (Scudder ePub). This collection of letters can be found online free at ProjectGutenburg.org. – Try not eating for as many hours, days, and in Catherine’s case, years as you can. Each time you feel a stabbing pang of hunger, remind yourself that you are sinful and of the flesh. This hunger is the Devil doing his work, and you should pray to Christ for salvation. – Instead of having an imaginary friend, and for you lonely gals out there, an imaginary boyfriend, why don’t you try conversing with Christ? If you two get along he may even ask you to be his bride. You should marry him if he asks—the sooner you do this the better, but don’t tell anyone until they try to make you get married. – Begin to write letters, lots of them, like way more than you would ever post on Facebook. If you can’t write or read well, get a scribe or your own spiritual confessor to write them for you. I think you can just put an ad on Craigslist for one. – If you don’t know who to start writing your letters to, try this: go through the contacts on your phone, your family’s phones, your friends’ phones and pick out people you find morally corrupt, politically unjust, and slanderous—these are the people you should write to. – You should also try writing to the Pope or the President or the Archbishop of Canterbury or any major political and religious figure. Tell them to do something outrageous like figure out what we are going to do about Syria, or relocate the White House. – Don’t worry that you don’t know these people. You just have to explain to them that you have a direct covenant with Christ and everything you say in your letters is actually the word of Christ. Don’t be afraid if the people you are writing are richer and more powerful, or that you only a woman—remember God is on your side. – The crazy thing is that the people you are going to write are actually going to listen, a few are going to curse you out, but the majority will listen . . . now what? Well it is a good idea to keep having mystic visions and going into trances so that people will continue to believe your relationship with Christ. – If you are having trouble having visions, keep starving yourself, and try staring at a blinky light or kneeling and standing up too fast, or spinning in circles till you fall. – Live only on communion, sleep on boards and pray constantly. The body and blood of Christ will sustain you. I hope these helped! Let me know if you can think of others!